Do you own an Armalite rifle (AR-15)? If so, according to this CHILD, David Hogg, you are hunting human beings! First off Armalite rifles are not these alleged “assault weapons” gun grabbers keep labeling them. Frankly the term was made up to demonize the weapons and anyone using them, to increase shock value like Hogg does here when he calls them military weapons. They are in fact sporting rifles the military’s M4 is based on but equipped with selective fire; it can fire in semi-automatic (1 bullet fired per 1 trigger pull) and full automatic (multiple bullets fired with 1 trigger pull). Civilians DO NOT have easy access to said types of weapons. In order to get an selective fire weapon one not only needs a basic DOJ background check conducted but they will also go through an ATF background check, pay a tax and be prepared to spend at a minimum $20,000 for a weapon with full auto capability. You CANNOT go to the corner gun shop and buy one of these weapons, anyone saying otherwise is LYING. No one is hunting people, Americans who own Armalite rifles are exercising their Second Amendment rights. This child is making those who wish to protect/defend themselves, their family and property into criminals. Hogg is being used by the unhinged left to advance their anti-gun agenda to disarm the people. 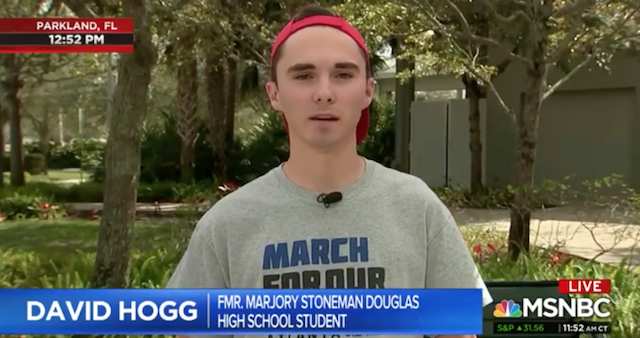 They know people are ignoring the “old people” on the issue, so they jumped at the opportunity to use this kid and the others from Stoneman Douglas to advance their agenda. Take note not one word mentioned how the system failed at multiple levels to prevent the shooting last year. The school and Broward Sheriff are responsible for what happened, that kid should’ve been in treatment if not locked up long before he bought the weapon. But isn’t that just like progressives to leave the important details out, especially when they blow their narrative out of the water!? The kid is desperately trying to hold on to his 15 minutes of fame, to keep the door open with the media. Just listen to MSNBC’s Mitchell fawn over Hogg, looking forward to speaking with him in the future. God help us if this kid gets a job in the media, he clearly wants to be the next Jim Acosta!